As said by Nicky Campbell, Radio 5 Live DJ and “animal lover” this morning at around 7.56am. 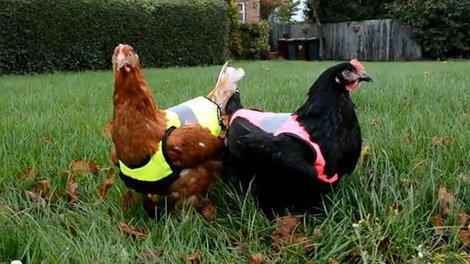 It was in response to an item on the Radio 5 breakfast show when the director of Omlet, the company behind the eglu and now a hi-vis jacket for chickens crossing the road, was asked what type of companionship chickens provide as pets. ‘Don’t say that!’ shouted Nicky. ‘I’ll never go to Nando’s again.’ He then actually went ‘La La La La La…’ so as not to hear anything else the Omlet director said about the intelligence, sociability and sentient behaviour of the chicken. And there it was. The meat eater’s response to the knowledge of cruelty and injustice: I don’t want to know. La la la la la. Rather than listen, and face the terrible knowledge of who, not what, these nonhuman animals are, it’s so much easier to maintain the dissociation. It’s a strange one for Nicky Campbell. On his Twitter account, he calls himself an “animal lover” and retweets the stories of animal abuse from other Twitter followers. If you are an animal lover, Nicky, I’d like to challenge you to think about the chicken in the way you think about your dog or cat. Just for five minutes. Think about the reasons not to eat chickens. Can you do it? For many it can take strength of will to overcome all those obstacles to knowing–and feeling–what happens to the animals that are consumed for food and products. It is difficult, for so many reasons. To begin to face the truth about nonhuman animals, particularly those used for food, is to acknowledge your role in their ill treatment and abuse, before turning to a plant-based diet. That can be an emotionally traumatic process. But small steps. As Johannes Paul pointed out, chickens are now in the top 10 pets kept in the UK. They are kept for companionship as well as by those people who want to harvest their eggs, often as a way to bypass the cruelty or antibiotics that are inherent in the egg industry. That means more people are living with chickens and seeing their personalities and having to face, perhaps, the choices of eating chicken, perhaps the most hard-done by of all the farmed animals we as a human species consume. After hearing Nicky Campbell do the ‘la la la’ to maintain his cognitive dissonance, I picked up my phone and wrote out a text to Radio 5 to comment on what had happened. And then I deleted the text, and carried on with my morning. It was the same yesterday, when I posted on Facebook challenging people to ‘carry on, you have your bacon sandwich’ after reading about the tragedy of the pigs who are being live transported to the slaughterhouse in Toronto in the polar vortex that’s hitting North America, of temperatures as low as -23C. There was the witness account of one pig having to be scraped off the side of the metal truck to which it had frozen with a big wooden panel. This pig was still alive. Most of the pigs had chilblains and purple frostbitten ears. The witnesses of Toronto Pig Save ran to the slaughterhouse to hear the worst screams from the pigs they had ever heard. Pigs who are as social and as intelligent as a three year old child. And I wrote all this in my post on Facebook to share the story. And then I deleted it. La La La. Let people carry on with their bacon sandwiches. Why did I delete both? Because I’m wary of being the vegan killjoy. I’m tired of living in a world of meat eaters who will not show compassion towards these nonhuman animals with needs, desires and a will to live, and who clearly suffer a great deal of pain at our hands. Or rather, I was tired yesterday. Just very tired, due to work, starting running again, getting into a routine. And I do care what people think of me, and don’t want to alienate people. I want to ‘save face’. And am also, I suppose, coming to the knowledge that such anger is not productive in changing people’s attitudes. But it’s something I feel rise up now and then. It all goes into the pot to think about, and help me answer the important questions. What can I do to stop this? What is the maximum impact I can have? I thought that I was being less courageous. But silence isn’t always about losing your voice. It can be about having patience, and finding the right voice, much like a writer needs to sometimes not share what she is saying, to speak only to herself, hear the voice in her own head first, and then speak.